We didn’t get a chance to watch The Grinch at the theater last year, so my girls were over the moon when it arrived in our mailbox last week! They laughed so hard throughout the entire movie and even my hubby sat down to watch with them. Don’t tell him I told you, but he’s a huge fan of The Grinch. 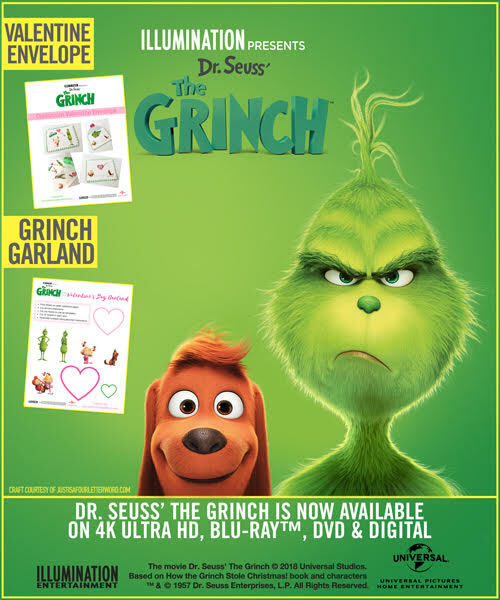 We’re so excited to share that The Grinch will be in stores on Blu-ray/DVD starting on February 5th! Make sure to pick up a copy! It would make the perfect addition to your Valentine’s Day baskets too. Thank you, Universal Pictures Home Entertainment, for sending us a copy! All grinchmas opinions are our own. This post contains affiliate links. The new home entertainment edition contains more than 60 minutes of bonus content, including three mini-movies: “Dog Days of Winter” starring the Grinch and his heroically loyal dog Max; and “Yellow is the New Black” and “Santa’s Little Helpers,” both starring the lovable Minions. It also includes stunning featurettes, a how-to-draw tutorial and much more. Narrated by Grammy Award®winner and Oscar® nominee Pharrell Williams, Dr. Seuss’ The Grinch stars Academy Award® nominee Benedict Cumberbatch (Dr. Strange, “Sherlock”) as the infamous Grinch, who lives a solitary life inside a cave on Mt. Crumpit with only his loyal dog, Max, for company. Theincredible voice cast includes Rashida Jones (“Parks and Recreation,” The Muppets) as Donna Who, Kenan Thompson (“Saturday Night Live”) as Bricklebaum, Cameron Seely (The Greatest Showman) as Cindy-Lou Who, and featuring legendary actress Angela Lansbury (Anastasia, Beauty and the Beast) as the mayor of Whoville. Funny, heartwarming and visually stunning, Dr. Seuss’ The Grinch is a perfect night in for the whole family! Plus, if you’re looking for a fun Valentine’s Day craft with The Grinch make sure to click on this link or the photo above! Now, don’t forget to get The Grinch on Blu-Ray/DVD/Digital now in stores! Will you be picking up The Grinch on Tuesday?